After yesterdays disastrous baking attempt which was going to be my Christmas cake, I wanted to bake something – anything! I wanted to feel that I can still bake so I decided on cupcakes, simple, easy and you can’t go wrong. I wanted to make a nice winter warming cupcake so I chose the ingredients which make me feel warm and snuggly – rum favouring, cinnamon and nutmeg. I use rum flavour as I don’t actually like the taste of rum the drink. I’ve tried both dark and white rum and neither of them taste how the rum in rum truffles does. I was very disappointed when I realised. Although these flavours also remind me of Christmas, they can’t be Christmas cupcakes yet because I haven’t put my tree up! The countdown is on till it goes up though – 4 days to go. As I write this I’m eating one of the cupcakes and I deem it to be a light, fluffy, baking success. Hurray! In a bowl cream together the margarine and sugar till light and fluffy then add the rum flavour. Mix together the flour with the cinnamon and nutmeg. Add 1 egg and 1 tablespoon of flour into the creamed mix and stir till just combined. Do the same with the 2nd egg with 1 tablespoon of flour then add the leftover flour and stir till smooth. Separate the mix into 12 pretty cases and bake in the oven for at least 20 mins. When they have cooled then decorate however you like. 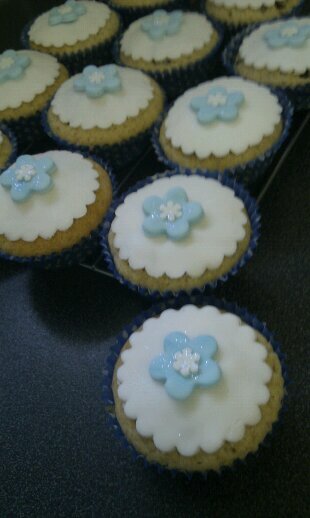 I used fondant icing, blue glitter and some snowflake sugar shapes.